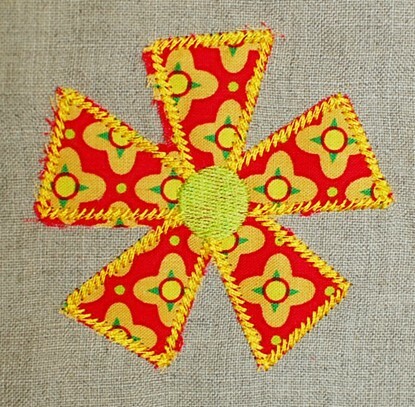 These flower patches have a buttonhole in the center--perfect for buttoning on to headbands, tote bags, jackets, backpacks, jeans, shirt plackets, etc. See this blog post to learn how to make them. buttonhole flower 1 patch small 1.6"x1.6"
buttonhole flower 1 patch medium 2"x2"
buttonhole flower 1 patch large 2.6"x2.6"
buttonhole flower 1 patch extra large 3.1"x3.1"
I made sure I put the polka dots as their own color that way you can easily skip that color change to eliminate the dots. Last photo shows you other buttonhole patches available. Made totally in the hoop! Adds a great 3-D effect when layered together with flowers.